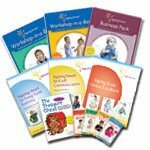 Whether you are new to teaching sign language or are looking to enrich your current offerings by becoming a part of a growing team of Signing Smart Instructors, the Instructor Basic Pack has everything you need! The information and activities in the Play Class curriculum make it easy for you to run a research-proven, interactive, parent-child Signing Smart series. Includes detailed, step-by-step descriptions for and outlines of 10-weeks' worth of programming. Curriculum incorporates over 180 interactive parent-child activities and songs, as well as 10-weeks worth of parent education information focused on Signing Smart for early communication and facilitation of early language development and intimacy. The Workshop-in-a-Box (Power Point slide-ready) curriculum will allow you to reach adult-only audiences in 2-hour or 3-hour single session as well as multi-session formats. More than just motivating parents to sign, this workshop helps parents develop a plan for getting started with Signing Smart. In addition, through interactive activities and video demonstrations we teach parents techniques to take advantage of the Four Keys to Signing Smart Success: how to create contexts in which children most easily learn signs, how to bring signs into children's world (so they never have to look at parents to see the signs! ), how to recognize children's first signs, and how to sign in all kinds of contexts without needing to sign all day or even every time parents say the word! Included as an added bonus is our Business Pack. Amazingly, instructors also receive a sample set of the complete line of Signing Smart printed materials for families. The Intructor Basic Pack also includes: CDs of supporting materials and handouts; DVD Clip Bank of of families "at home" using and demonstrating Signing Smart strategies, and child versions of many target signs. Please Contact Us for information on becoming a Signing Smart Instructor and to purchase the Instructor Basic Starter Pack.